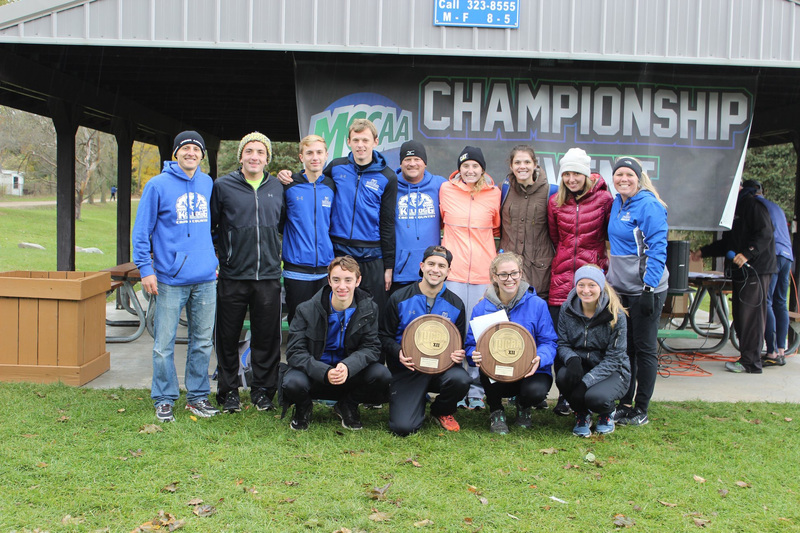 Kellogg Community College’s men’s and women’s cross-country teams are recruiting after a banner fall, when they finished their inaugural seasons as regional champions and brought home several individual awards, including two All-American awards and Coach of the Year honors. Both teams earned first-place honors at the Region XII Division III regional meet to earn a berth in the national championship meet in Massachusetts. The men’s team finished fifth in the nation out of 39 teams at the following Division III National Junior College Athletic Association National Championships in November, and the women’s team finished seventh in the nation out of 37 teams. Standout freshmen Kyle Strong (Vicksburg/Vicksburg High School) and Maggie Wood (Battle Creek/Lakeview High School) both earned All-MCCAA Team, MCCAA All-Freshman Team, NJCAA Region XII Division III Meet Champion and NJCAA Region XII Division III All-Region Team honors. Wood was also named an NJCAA Division III Second Team All-American; Strong was named an NJCAA Division III Honorable Mention All-American. Also earning individual honors for the Bruins were freshmen Joe Glubke (Battle Creek/Lakeview High School) and Emma Berning (Battle Creek/Harper Creek High School), each named to the Region XII Division III All-Region Team. Head Coach Erin Lane, a Battle Creek native who was a standout runner at Battle Creek Central and Pennfield high schools and later at the University of Michigan, earned the Region XII Division III Coach of the Year award in her first year of coaching at KCC. Lane said the teams are very pleased with the outcome of their first seasons at KCC. The addition of men’s and women’s cross-country teams at KCC this past fall is part of a new strategic vision for the College’s Athletics Department that includes a new Miller Physical Education Building; five new sports teams; and potential for new associate degree programs. The College’s new women’s soccer team will begin competing this fall, and men’s and women’s bowling teams will be added in 2020-21. These teams will expand on the College’s current offerings of baseball, men’s and women’s basketball and women’s volleyball. The College is also exploring the potential for creating new associate degree programs in sports management and exercise science. For more information about cross-country at KCC or about recruiting for next season, contact Coach Lane at 269-565-2133 or at crosscountrycoach@kellogg.edu. Potential recruits can also fill out KCC’s Prospective Student-Athlete form online at www.kellogg.edu/prospective-student-athlete. For more information about athletics at KCC, including the men’s and women’s cross-country teams, visit www.kellogg.edu/athletics. Pictured above, KCC’s men’s and women’s cross-country teams pose for a group photo after winning their regional championships. Photo courtesy of Anita Robertson.